Working with La Deco Flora was pure fun and yet professional. Sharlene was able to fulfill my needs and showed her commitment to her trade by going beyond the expected. She was able to guide me and my ideas into tangible creations and even assured my anxieties by allowing me to join her down in the floral mart. She delivered amazing color to my wedding and I look forward to future events detailed by her. 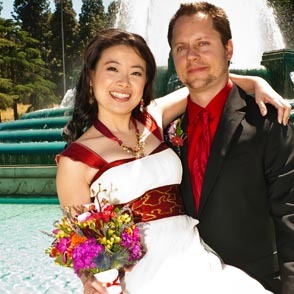 My husband and I were so extremely lucky to have Sharlene Choy as the florist for our wedding. She listened to our thoughts and preferences, and then provided us with useful insight and creative alternatives so that we were able to stay within our budget. When I saw the final product on the day of our wedding, I was beyond amazed. Everything that she delivered was absolutely perfect, and far exceeded my expectations. Her beautiful floral arrangements added an extra, elegant touch to the ceremony and reception decor. We will definitely be using her for any future floral needs, and will highly recommend her to all our friends and family! Sharlene did a great job of assessing my personality and choosing flowers that reflected my taste and style. Beside d oing an amazing job at our wedding day, she also gifted us with a lavender plant, which was our favorite and it's still blooming in ou r front yard! We couldn't have been happier.